Kasargod, July 11, 2015: There has been a new twist to the case of murder of an eight year old boy by a man said to be mentally ill at Periya Kaliyath. It has now been gathered that the accused had killed the boy to settle scores as he had a grudge against the latter’s father. It may be recalled here that Mohammad Fayad, son of Ayesha and Abbas couple was reportedly stabbed to death on July 10, Thursday by one Vijayan (32) when the former was on way to school along with his little sister and another child. 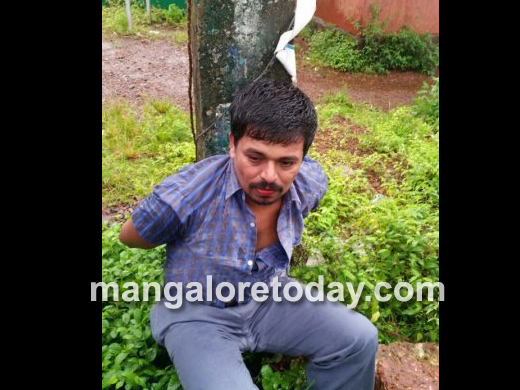 The accused was later caught hold of by locals and handed over to police after thrashing him. What has been gathered now is that Vijayan who used to earn a livelihood by peeling coconuts, had nurtured a grudge against the boy’s father Abbas since a year. As already reported a year ago Vijayan was arrested for calling up the police and making a false claim that a bomb had been planted on a railway track. Upon his release he used to tell people that he was arrested after being tipped off by Abbas. When Vijayan’s photo appeared in newspapers, he blamed Abbas saying he had provided the photo to the media. When Vijayan’s cat had died a few days ago, he had passed the blame on Abbas and the same was the case when Vijayan was hospitalised some time back for psychiatric treatment. The police who gathered the above information during interrogation of Vijayan have now learnt that unable to target Abbas, Vijayan had chosen to attack his son. The accused has been produced before the court and remanded to judicial custody. There is information that police may seek his custody for further interrogation. In the meantime, it is said the accused is a BJP-RSS activist and that he was branded ‘mentally ill’ just to get him out of the case. A demand has been put forth by several parties and organisations for an in-depth investigation into this case.